In part two of Dr. Michael Koczarski's program on taking a mock-up to completion, Dr. Koczarski evaluates the completed mock-up to see how close it is the finished restoration. Dr. Koczarski will demonstrate a minimal preparation and seating of the final restorations, he will also demonstrate how to correct the gingival zeniths using a diode laser. From the mock-up, to the provisionals, to the seating of the final restorations, this program will explain why Dr. Koczarski believes each step is predicated on the next and help deliver predictable results every time. 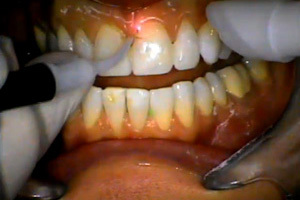 Understand how to correct the gingival zeniths using diode laser. How to effectively communicate with your lab. Use the mock-up as a cut back guide. Create veneer temps using the mock-up stint. Compare the temporaries to the final result of the finished veneers.